Home » Bible » Is Scripture without Error? 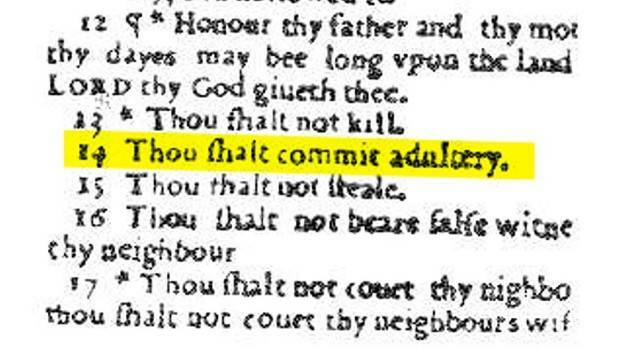 The infamous misprint in the 1631 edition (dubbed “The Wicked Bible”) of the King James Version, omitting the word not from the seventh commandment. Evangelical Christians believe that Scripture, as the written word of God inspired by the Holy Spirit, is without error (inerrant). This article will explain why. In this article, we will be looking at this issue as Christians who already accept such basic beliefs as that God exists and that Jesus is the Son of God who died and rose again. In that context, we will explain why belief in the inerrancy of Scripture is properly a Christian belief. The main reason that evangelicals believe that Scripture is inerrant is that this is how Jesus Christ viewed Scripture. Of course, not everyone believes in Christ; but for those of us who do believe he is the Son of God, what Jesus taught about Scripture should be foundational to our view. “Have you not read…?” (Matt. 12:3, 5; 19:4; 21:16, 42; 22:31; Mark 2:25; 12:10, 26; Luke 6:3). Jesus told the Sadducees that they were wrong because they did not know the Scriptures (Matt. 22:29; Mark 12:24). He reminded his Jewish critics that “Scripture cannot be broken” (John 10:35). He said that certain things would happen “to fulfill all that is written” in the Scriptures (Luke 21:22), and he even said that the Scriptures “must be fulfilled” (Luke 24:44; see also Matt. 13:14; 26:54, 56; Mark 14:49; Luke 4:21; 22:37; John 13:18; 15:25; 17:12). Some people who reject the inerrancy of Scripture may object to these references to the Gospels. Aren’t we assuming that Scripture is inerrant in order to prove what Jesus said about Scripture? No, not at all. We are citing the Gospels as historical sources of information for what they can tell us about Jesus’ teaching. Assume for the moment that the Gospels are not inspired Scripture. They are still our best sources of information about what Jesus said and did. If you don’t accept what all four Gospels repeatedly tell us about how Jesus viewed Scripture, what can you know about Jesus? Probably very little. Again, we are discussing here what Christians, who already believe in Jesus Christ, should believe (for more on this subject, see the article “Jesus and the Inerrancy of Scripture”). Speaking of the Gospels, another objection is that Jesus’ statements about Scripture referred only to the Old Testament, because the New Testament (which includes the Gospels) had not been written yet. However, no one who raises this objection and who professes to believe in Jesus actually believes that the Old Testament is inspired and inerrant but the New Testament is not. In fact, most people who question the inerrancy of Scripture are much more skeptical of the Old Testament than of the New. Here’s why the objection fails: Some of Jesus’ statements about Scripture, such as “the Scripture cannot be broken” (John 10:35), are categorical statements that must apply to any and all books of Scripture, not just those written before he spoke. As an analogy, when someone says “The Supreme Court’s decisions about what is constitutional are final,” that statement applies to Supreme Court decisions at any time, not just before the person made the statement. But the Helper, the Holy Spirit, whom the Father will send in my name, he will teach you all things and bring to your remembrance all that I have said to you…. But when the Helper comes, whom I will send to you from the Father, the Spirit of truth, who proceeds from the Father, he will bear witness about me. And you also will bear witness, because you have been with me from the beginning…. He will guide you into all the truth, for he will not speak on his own authority, but whatever he hears he will speak, and he will declare to you the things that are to come (John 14:26; 15:26-27; 16:13). We see here the broad categories of New Testament writings: remembering what Jesus said (the Gospels), the apostles being Jesus’ witnesses (Acts, see especially Acts 1:8), being guided by the Spirit into all the truth (the epistles), and knowing what was to come (Revelation). In short, Jesus affirmed that the Old Testament Scriptures were the word of God and without error, and he laid the foundation for viewing the writings that came from the apostles as Scripture with the same inspired authority. For most of history the inerrancy of Scripture was the common, accepted view among both Jews and Christians. Of course, Jews and Christians disagree about which books are Scripture, since Judaism rejects the New Testament, but they have agreed historically that whatever books are Scripture are inerrant. Again, the question of the “canon” of Scripture—which books should be recognized as Scripture—is a different question than whether Scripture in inerrant (on the canon, see the article “Do We Have the Right Books in the Bible?”). All Jewish groups in Jesus’ day accepted the principle of the inerrancy of Scripture, even though they often disagreed about many other things. For example, two very different Jews in the first century were Philo of Alexandria, a Jewish philosopher who drew heavily on Platonist philosophy, and Josephus, who wrote histories of the Jewish people for the Romans. Both of these writers held to the inerrancy of Scripture. Orthodox Judaism continues today to teach that Scripture is without error. Christians throughout church history have also viewed Scripture (both Old and New Testaments) as the verbally inspired word of God and therefore as without error. In the first generation of the church, we find this view of Scripture in the writings of Paul (2 Tim. 3:15-17) and Peter (2 Peter 1:20-21; 3:15-16) and in the book of Hebrews (Heb. 1:1-2; 3:7; 9:8; 10:15). Their view of Scripture was the standard view until the rise of modern skeptical views of the Bible. Consider, for example, what three of the greatest figures in church history said on the subject. Augustine of Hippo, the most influential of the early church fathers (late 4th–early 5th centuries), stated: “It is to the canonical Scriptures alone that I am bound to yield such implicit subjection as to follow their teaching, without admitting the slightest suspicion that in them any mistake or any statement intended to mislead could find a place” (Letters 82.3). Thomas Aquinas (13th century), the greatest of the medieval Christian theologians, wrote: “Only to those books or writings which are called canonical have I learnt to pay such honour that I firmly believe that none of their authors have erred in composing them” (Summa theologiae 1a.1.8). Martin Luther, the father of the Protestant Reformation (early 16th century), affirmed: “Everyone knows that at times they have [the early church fathers] erred as men will; therefore, I am ready to trust them only when they prove their opinions from Scripture, which has never erred” (Weimarer Ausgabe, 7:315). Obviously, the doctrine of the inerrancy of Scripture is not a new idea that evangelicals invented. It was the standard Christian view of Scripture throughout most of the history of Christianity. Again, for Christians historically this issue has not been a matter of opinion, because the Lord Jesus himself taught that Scripture is inerrant. What is new is the notion that one can be a follower of Jesus Christ while at the same time claiming that the Bible is not fully trustworthy because it supposedly contains numerous errors and contradictions. Although Jesus and the apostles affirmed the inerrancy of Scripture, they did not engage in detailed discussions or debates about it because it was generally accepted by Jews. Once Christianity had spread far and wide among Gentiles in cultures that did not share that belief, it became necessary for Christians to explain and defend it. In particular, Christians began addressing various apparent difficulties in Scripture, showing that Scripture was neither inconsistent nor unreasonable in what it said. If we are perplexed by an apparent contradiction in Scripture, it is not allowable to say, The author of this book is mistaken; but either the manuscript is faulty, or the translation is wrong, or you have not understood (Against Faustus 11.5). Here Augustine identifies three factors that may be involved in any apparent error in the Bible: a copying error in the manuscript, a translation error in the version one is reading, or an error in interpreting what the Bible says. The point is that the doctrine of the inerrancy of Scripture acknowledges that these kinds of errors do occur. We discussed these three factors in previous installments of this series, dealing with the copying of the Bible (part 1), translations of the Bible (part 2), and interpretations of the Bible (part 4). Let’s briefly look at an example of each. Copying error: 2 Samuel 6:23 says that Michal had no children while 2 Samuel 21:8 in the King James Version (KJV) refers to “the five sons of Michal.” The problem here is probably a copying error that made its way into the medieval Hebrew text (which had remarkably few such errors, by the way). Since the KJV was published, scholars have become aware of many earlier manuscripts in Hebrew, Greek, and other languages that say “the five sons of Merab” in 2 Samuel 21:8, which is reflected in most modern versions. See our article “Did Michal Have Children or Not? 2 Samuel 6:23 and 21:8” for a more detailed discussion of this example. Copying errors are even rarer in printed editions of the Bible, but occasionally they do happen, as in the case of the so-called “Wicked Bible” that accidentally omitted the word not from the seventh commandment (see the image at the beginning of this article)! Translation error: In Hebrews 4:8, the KJV says, “For if Jesus had given them rest, then would he not afterward have spoken of another day.” This statement seems to contradict Jesus’ statement, “Come unto me, all ye that labour and are heavy laden, and I will give you rest” (Matt. 11:28). The problem here is very simply that Hebrews 4:8 is a mistranslation: it should say, “If Joshua had given them rest….” The mistake arose because the names “Jesus” and “Joshua” are the same in Greek. Interpretation error: Mark 16:1 reports that “Mary Magdalene, Mary the mother of James, and Salome” went to the tomb of Jesus, whereas Luke 24:10 reports that “Mary Magdalene and Joanna and Mary the mother of James and the other women with them” had gone to the tomb. Thus, Mark mentions three women and Luke mentions at least five, and Mark mentions Salome but Luke mentions Joanna. Is this a contradiction? No, because neither Mark nor Luke claims to be giving a complete list (in fact, Luke refers to “other women,” leaving unspecified their names and how many there were). Reading Mark 16:1 to mean that only the three women named there went to the tomb is a misinterpretation. In short, when Christians affirm that the Scriptures are inerrant, they mean that they are without error when we are reading the correct text, translated correctly, and understood accurately. With these common-sense qualifications in place, we are on solid ground in affirming that the Scriptures are without error.